The SNAG X Controller Folder is designed to compliment the SNAG X Live Blade Controller. SNAG X CT can be used as a training tool but is also extremely effective in the field. 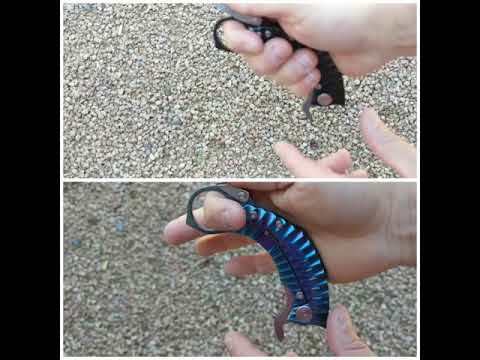 It is a great tool to practice with before using the SNAG X Live Blade Folder. The sculpted blue toned frame gives it a sleek and modern look and lets you know ‘blue’ for safety; no edge, no tip. Like the SNAG X Live Blade Folder, it comes with the KRUDO’s easy pocket deployment feature (D.O.T). It’s an excellent, less than lethal tool. While it was designed with those in law enforcement, security and CQC environments in mind, anyone who wants reassurance will enjoy SNAG X Controller. SNAG X CT is the only pain compliance tool you will need. I waited over 2 years for Krudo to finalize production on this SnagX after seeing it at shot show a few years back, and oh boy was it worth it!!!!!! I just received it in the mail with a wonderful Krudo box with what appears to be a laser cut foam insert. OUTSTANDING! I love this new controller, it is much easier to deploy even without tough pants material. It is absolutely gorgeous. If you have or have wanted a controller NOW IS THE TIME!